Grace Abaho Sr: THE HISTORIC DEBATE(S): THE SYMPHONY OF HARMONY, "THE THING." THE HISTORIC DEBATE(S): THE SYMPHONY OF HARMONY, "THE THING." 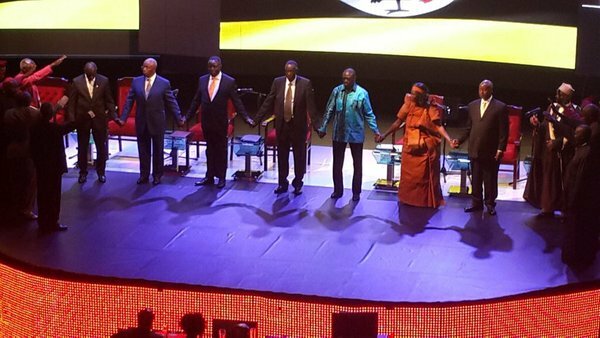 When the presidential Aspirants held hands across the aisle, just before the second presidential debate. Basically, a very objective analysis of the debates against the status Quo has been made: I am very humbled to be making this analysis of the first historic debate in the republic of Uganda; an important learning curve .I clearly articulate the facts in a way that will get Uganda better, and not bitter, and also keep the African Hopes alive. If you listened intently to the articulation of matter over substance, you will love this analysis and it will seal the deal for the best choice candidate. I personally have mine and I will not cower to say his name, the People’s President: DR.KIIZA BESIGYE WARREN KIFEFE (RTD COL). PRESIDENT MUSEVENI. Y. K: He is leader of the thirty year old regime who dodged the first Presidential debate under the pretext of a busy schedule to which he laid the hypocrisies. A day later when he made very uncouth comments saying he couldn’t attend the first debate because it was just “secondary kids’’ in a debate. That was a very gross misrepresentation of facts and utterly disrespectful, the debate being a Presidential candidates’, to which issues of national interest were tabled. A lot of heat preceded the events of course especially after he out rightly spilled his utter arrogance and unwarranted need for attention even when he knows it too well he has a very tough sell now: because the people are tired of his leadership and would rather try a new ‘knight’. Missing him on the first debate was so defeaning.He wasn’t physically present, at the first debate, but the truth is surely he could still have his place in the very details of the discussions. His place is one that isn’t the best to have for a leader of a thirty year old regime: dodging the ever first nationally organized debate for the Presidential hopefuls. To this effect, the nation and world over questioned his ability to take the country to the next level. As often the case, he condescended and played twinkle toes, much as he couldn’t pull it off forever. So much happened along the way, with the VOA journalist Shaka Ssali was chosen as moderator amongst the team of moderators and he was quoted saying he couldn’t attend in the event of him being the key moderator. Well, as usual, as his inconsistences have often been his most upheld consistency he showed up: to a “Children’s debate’’ and also moderated by Shaka Ssali though not as major moderator. Now that’s what we talk about when we talk about Cognitive Dissonance. On oil, he says and believes the NRM, him as the commander in chief is everything there is to the oil discovery. That is insane and often misleads his perspective of thought on the dire need for him to wake up to the reality that Oil resource is for all Ugandans and not just a single party or president. I have grown very conscious of Mahtma Ghandi’s beautiful words: “Earth provides enough for every man’s need but not every man’s greed”. Every time I hear him lay claim to the oil without shame, I am left with no other option but to be reminded of this profound statement. On the Congo saga to which we are owed ten billion shillings that Besigye properly tabled, he claims all there is to our involvement in DRC was to protect us from them, that’s befuddling of facts trying to over step the avenues of truth. On the ICC, President Museveni said a big YES to keeping Uganda out of it, that we often question knowing this a backup plan after the very nearing defeat: an escape route to the crimes he has committed against humanity while meddling Musevenism all the way. Nothing of this grim denouement was unforeseeable-----or, for that matter unforeseen. DR.KIZZA BESIGYE WARREN KIFEFE (RTD COL): This is the leader of the strongest opposition party and the strongest opposition leader the Museveni government has ever known. At once, I would like to say very importantly,Dr.Besiigye broke the mold of conformism when he succeeded from the strayed NRM party fifteen years ago: Just like Museveni’s thirty years of Presidency matter,ofcourse,without factoring Dr.Besigye’s earlier relationship with Museveni;we would be very unfair. That informs and ideally, illuminates---his perspective and carries a Positive symbolism that can’t and shouldn’t be ignored. His towering intellect and trenchant wit has got most of the often ‘done’ things ‘done’: things not done till talked about.Museveni and his ‘worshippers’ have often besmirched him as a chaotic leader ever since his secession but that’s utterly untrue: Dr.Besigye is a true freedom fighter, one that cares about freedom for all, and would like everyone to move with a ‘swagger’. The most part of his political career as an opposition leader has been an authentic calling out of President Museveni’s meddling of dictatorship, a dictatorship they fought very hard to end with the bush war back in 1986, remember these two were close allies then. Dr.Besigye continued to assert that its unfortunate power handover has never been peace in our country, that’s on record, and is something to worry about as well as pray for. To this, the often used chorus of his trails ever since he came through on the opposition ship made more meaning, to give power back to the people. Dr.Besigye made a very highly fundamental point while stating his position on regional integration: “structural problems are the major hindrance to the integration: the problem is with the leaders and not the integration of the people”. Anyone very aware of history knows by fact check, that’s very true, if we can cite an example of the times of former Ugandan president the late Idi Amin and Tanzania’s Kambarage Julius Nyerere. On foreign investors, he questioned the kind of investors the Museveni government has often given chances, calling them fake rather than foreign investors. He pointed out the example of Shimoni and Coffee marketing board, I can say as a matter of factly that was also the realest talk we had in the house. That is a very disheartening issue that needs to be looked into very seriously. On Uganda’s involvement in Congo to which President Museveni tried to condescend peddling fiction, he made it very clear to the people that we need not to try to look around for a way to bury the inconvenient truths, but say it as it is: a very UNEXCUSABLE thing. His wife made a nod in total agreement, the kind of agreement your dear wife gives and the world admires in the background, and these two can surely make a great team: commander in Chief and first lady, respectively. On the Oil question, whether it is a curse or not, Dr.Besigye gave the best deserving answer. He eloquently answered: “Yes, Oil is a curse in the hands of a an unaccountable and corrupt regime”.Dr.Besigye didn’t mince words when it came to reminding the president how the parliamentarians were ferried in army uniform to Kyankwanzi,where they were given good money, that finally lead to the passing of the oil clauses President Museveni had earlier mentioned. This question was a tone setter as per the revelations of the often made outlandish statements that it is “his” oil and he will not leave when it has just been discovered. In the wake of this comment, President Museveni shrunk, though he couldn’t swallow the pride even so.It is often ignored but what President Museveni intends to advance, looking at our oil as personal property, is totally out of step with history and constitutional principles. His ending statement is very true of him: “I am an eternal optimist, that’s why I keep on trying”. This is one thing that any objective analyst would say of Dr.Besigye.His unwavering determination and dedication to the quest for freedom is a very important attribute to him.Dr.Besigye honestly has done all it takes, he has a very formidable work plan, he can do very beautifully as the next commander in chief. HON.JOHN PATRICK AMAMA MBABAZI: He is a lawyer by profession and has quite a profile. He is a former prime minister and leader in various government positions. He has served and worked with President Museveni for over thirty years. He did quite fairly on the first presidential debate, him being a very recent defector from the conformism to Museveni, though still in the NRM.On the issues where he finds his hands in a very close relationship, he even often slides it off to having limited or no powers, while he worked with President Museveni.I find it very hard to believe his rhetoric wholesomely, he strikes me as a sincere-sounding liar, though can help in weakening the Museveni NRM base. He did a very good display of information power, having served as security minister in Museveni’s time for a while; he called him out on the security he sings allover. He tactfully asked a few hard boiled questions. What kind of security are you talking about when eighty three percent of the youth are unemployed? What sort of security are you talking about when the hospitals are in sorry state and expecting mothers die like chicken?Wow,these were very solid questions, thanks John Patrick. MAJOR GEN (RTD) BENON BIRARO: He had a very nice presentation in the first debate, that can’t go without mentioning. Honestly, if he had come out earlier, he would be having a huge following already. I loved the most these two things: the Maputo declaration rhetoric and the Indian external benchmark. It was surely a very nice show out there. Wait, there is a part he bored me with the ‘Bushmen’ rhetoric, I have heard enough of it enough. Albeit, he did really well with the comeback when he said that the involvement of the army in the NAADs; “the army are not in the NAADs to revamp the programme, they are there to have some work to do other than the ‘nothingness’ in the army”. That was a very nice show for sure. In the second debate, he still did well and I will cite out a few areas that can’t and shouldn’t be ignored. He said, in regard to having out troops in the other countries, foreign policy is about national interests and certainly you can’t do that in isolation of your own country. That was very eloquent; everyone could feel that ringing truth therein. As he noted on citizenship and being subjects, a citizen can be subject of the law, being a citizen oppressed by the government in power----that’s what democracy ought to deal with. As I have often said of Dr.Besigye’s unfettered quest for freedom: “one has not only a legal responsibility to obey the just laws, conversely, one has a moral responsibility to disobey the unjust laws”. So, the way Biraro brought up his idea rings at peace with what I believe in, unapologetically. ENG.ELTON JOSEPH MABIRIZI: He was the most ‘terrific’ candidate of the debates: comedy central’s mismatched talent in engineering. He didn’t have to convince you that he was on the wrong platform because it was practically showing. I know I can’t take away the constitutional right of any Ugandan to contest for Presidency but in my sincerest comment, he didn’t have to waste the twenty million Uganda shillings (the non- refundable fee to the EC).Again, I know it is okay to make headlines but honestly it’s not okay to forget that you are a father-figure in real life. His Children and wife may never recover from the humiliation he left for them to live with on that stage. I doubt he asked them how terrific he was when he stepped home. He strikes me as the kind, if elected, would be the direct equivalent of a weather vane that blows whichever way the wind blows, the good news is he can ‘never’ be President! He did ‘great’ as usual on the second debate, a role play that no one could play perfectly; he is proof positive that everybody in the world is equally important. Let me explain: He took away President Museveni’s grim face, which he had entered with earlier, and also kept him awake with unstoppable laughter for the entire debate. He begun by reminding the audience about the dire need to have women “down there –there” and went straight away to strip naked his drama script .When asked about Peace in the East African integration (Region), he bemoaned: we have to restore term limits if we want Peace, President Museveni’s two minute laughter was at this point in time, actually he almost used a hankie to wipe off the tears of Joy down his chin. Much as in his deluded mind he imagined himself as president, when he appeared late for the debate, saying he was just following protocol: the late appearance, him being president. The truth is Mabirizi is nuts and to take anything he says serious would be just to have a feel-good moment. We certainly do not need men like Elton Joseph Mabirizi anywhere even close to the local council; he should try his best suit: comedy! Ms. MAUREEN KYALYA: Maureen Kyalya is the only female presidential contender of this historic election. I remember well, Maureen is the candidate that thinks sociology is the next word that Uganda needs. She had quite an impressive start. Where she said that there is tear gas at every police post than there is medicine in the hospitals. I swear I clapped for her on this. I saw my uncle Dr.Besigye smile (I wish I could insert the moment here).And then, she acted more of a petulant child when she broke out on the Basoga rhetoric. That turned me off. I have heard enough of it from a powerful lady I will not mention here.To assume the basoga are the most neglected would be a terrible thing to believe. Maureen has a way of starting on fire; you can be seduced to like her just that her UK experience takes over thereafter: She makes me want to go to the United Kingdom very soon. The song she started with narrating the story of how President Museveni made them believe the ‘future’ was for them, then, was a winner. It was a class act out there, I earnestly admired that well scripted act there, it reveals of the true Museveni: Kudos Maureen Kyalya!If you read my earlier column, PRESIDENT MUSEVENI’S SLEW OF LIES here on the website, you know Maureen and I plus millions of Ugandans we agree to this. Well, as I said earlier, she starts well and soils everything up eventually. Maureen Kyalya when asked on what she could do about terrorism started off to pander over the issue with sheer nonsense, saying: “as a mother I can handle the terrorism affectionately”. Seriously? Does motherhood guarantee any special skill in dealing with terrorism? Well, if you are ignorant about this like I am, that’s the gospel according to Maureen Kyalya.It is extremely and purely unimaginable in the books of history: the day motherhood beat terrorism, terrific! She was the other candidate that made a very great cause-effect for President Museveni’s light moment, especially when she publicly shared how she and Museveni had talked over recruiting him as presidential advisor if she ‘ever’ became president, the President laughed so very much as soon this came out of her mouth: to which he said she had actually proposed a VP post that he declined, settling for presidential advisor.Well,again,the President found a very sweet friend in Kyalya other than the ‘renown’ Elton Joseph Mabirizi.Besides that, she can do something very productive as a women representative in a good government. PROF.VERNASIUS BARYAMUREEBA: Former Vice Chancellor of Makerere University and other impressive duties. He is a very nice match for the post of minister of education and Sports, science and technology. The part where he says he has been in an executive position at Makerere. That was a very perfect inclusive of showing his potential in this ministry, if ever appointed. Other than that, he may have some work to do to convince the nation that he is the right man for the job. He actually, sadly, wryly laughed at himself when he imagined himself as president in the second debate. Then again, on our brothers and sisters who are ill-treated in places they go to look for jobs, since they can’t be availed back home, he didn’t mince words: “ those ambassadors in charge are political failures who are appointed as consolation for their local humiliation”. That is a very sincere truth bomb, no one said ever. He left the public to a biblical thought quoting from Deuteronomy chapter 34; this immersion in scripture is a thing I admire personally, being an ardent lover of the scripture. He is a very resourceful person, since he has a snow ball’s chance at ever making it to the biggest office; he can concentrate on his university for now he gains ground. Also: in the second debate, he impressed me major on these: a time when he said that Uganda’s involvement in every war that rings within is playing a “father-figure”, unnecessarily. That was a very hard hit on the government for sure. We can’t afford to play along on each and every war that sneezes from the near vicinity and the far end while ignoring the pertinent issues back home. DR.ABED BWANIKA: A very pronounced agriculturalist. He too can do well in a good government under ministry of animal husbandry and fisheries. It’s really unfortunate he has failed to fetch the necessary popularity to run the show. I must say he is someone who has very calculated plans at his fingertips, he must be a very good researcher for sure, and his presentation has very rich factual data. It can’t go without saying that he gave a very brilliant answer when it came to the ‘popular’ Oil question: “Oil can never be a curse; it belongs to the people of Uganda, and not anyone in particular”. He went ahead to cement his point with clarification that actually anyone who lays claim to the Oil as personal property is a very cruel human being. He envisions the oil resource as a tool and booster for socio economic development: I totally agree with him, as long as it is not in the hands of a “corrupt and unaccountable regime”. On the question of the ICC, Bwanika was very deeply disappointing, can’t believe he falls prey to President Museveni’s backup plan. The ICC may not be perfect but as regards justice, they are surely doing a very commendable job, to say Uganda should have pulled out of it yesterday scars the psyche. We can’t afford to see leaders get away with murder and crimes against humanity just because out rigid pan African mindset is at work. To believe that flawed logic to the end would be very unbelievable: I refuse to buy into that sort of blurred rhetoric, with all my heart. AN AIR OF FINALITY: I know for sure Pre-electoral bragging is watered down in the office by the realities of actual power (briefly, 1986-2016, breathe in twice) .The illusions some of these candidates project that the incredible complexities of politics and economics, (both at home and abroad), can be solved by the simplistic solutions has never been so spine-chilling. The past few years have been frightening and fitful seasons (See the exhibits of unconstitutional constitutionalism… ‘Invisible constitution’, Laurence tribe, Harvard Law school) with moral outrage and police brutality, I see the Law as the sacrosanct. No matter the time lapse between now and the time justice is served, I believe in legal redress. On Election Day: Remember; “If you don’t vote, you don’t count’-Vernon Ferdinand Dahmer.